… and the list goes on. TSR-era Dungeon Magazine, OSRIC, Labyrinth Lord, Middle-earth Role Playing (Iron Crown Enterprises), Stormbringer (Chaosium), Villains and Vigilantes (FGU), Lord of the Rings RPG (Decipher), Castles & Crusades (Troll Lord Games), and many other products both old and new use small fonts and/or tight margins in order to fit at least 1000-1200 words on dense pages of text. Even the Lamentations of the Flame Princess modules, which are A5 format (approximately digest size), manage to fit 900 words on full pages! If your product fits less than 1000 words on its full pages of text, then your product wastes space, paper and money! On the left: The aforementioned Introduction page from the DMG, containing more than 1500 words. On the right: Page 22 from DF27 Red Tam's Bones (a Dragonsfoot module), which fits only 600 words on its dense pages of text! Side-by-side with the DMG, the enormous font and expansive margins of Red Tam's Bones gives the appearance of an early-reader's book! Red Tam's Bones contains 53 interior pages. 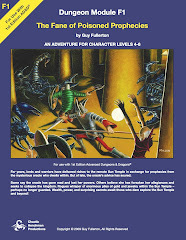 Does it seem reasonable to print out 53 pages for a module with about the same word count as a vintage TSR module? I don't think so. If Red Tam's Bones used appropriate font sizes & margins, it could have easily fit into the 32 page module format used by TSR. While a 1000+ words goal is acceptable, 1200+ words is better. 1000 words is actually the low end for typical products. As exemplified by the DMG, 1500+ words is not uncommon. Shoot for the middle of that range to get a comfortable result. Does a product need 1000-1200 words on every page? No, of course not; illustrations and gaps between paragraphs limit the potential word count on many pages. And of course, if your physical product is smaller than 8.5" x 11", adjust the goal accordingly. But if your font & margin choices don't allow at least 1000-1200 words to fit on an 8.5" x 11", no-artwork, dense page of text, then you're wasting resources. Admittedly, the examples above all use fairly minimalist visual designs. If you want to use a more elegant, elaborate design, go for it! Feel free to add border images, embellishments, headers, footers, or other design flourishes. Even with those niceties, you can still choose fonts, sizes, and margins that can fit 1000+ words on a full page. Please don't blindly accept your word processor's (or layout program's) default font, size and margin when you create a new file for layout. Many word processors default to a 12 point font and 1-inch margins. Instead, crank your main body text down to 8 or 9 point, or smaller if the font is still readable. Consider 1/2-inch margins. For professionally printed products (including print-on-demand), the margin can even be smaller, because the presses used by professional print houses don't have the same sort of minimum margin requirements that home printers have. Of course, not all of your text needs to be 8 or 9 point. Headers and titles should use larger point sizes, as should any main body font that's physically smaller than its point size suggests. Similarly, you might have good reason to use larger margins on one or more edges. For exampe, F3 Many Gates of the Gann uses a 0.63-inch margin on the outer edge to provide a bit of extra room for notes, but still uses 0.5-inch margins on the top, bottom and inside edges. To determine whether you chose good font sizes & margins, print out a test page and compare it side-by-side with a number of professional gaming products. If your body text is about the same size, you're on the right track. Otherwise, keep adjusting and comparing until you have a good result. Lower printing cost. Whether the product is destined to be printed at home, at a professional print house, or via a print-on-demand service, fewer pages costs less to print than more pages. Lower shipping cost. Fewer pages means lower weight, and shipping costs are often computed by weight. Lower art cost. Fewer pages generally means fewer illustrations to commission. Better-looking full justification. Smaller font sizes & margins give you more words per line. Higher word-per-line counts make full justification work out better. The first three benefits translate directly to cash-in-hand. Either the consumer receives the product for a lower price (compared to the same gaming content laid out in a suboptimal way), and/or the publisher keeps more profit. Both are fine with me. As a consumer, I'm paying for content, not page count. I'll happily pay $12 for a 20000 word module in 28 pages. If the publisher wants to save himself some production costs and squeeze the same content into 20 pages, I'll still happily pay $12, thus putting more money into the publisher's pocket. But I don't want to pay $20 for the same content just because the publisher used big fonts & margins and ended up with a 56 page result. Part 5 in the series covers Visual Design Tidbits. These are not the only metrics of value. A book is a physical artifact containing beauty in its structure. It is touched by hands and looked at by eyes. Design teaches that white space is not the enemy. Would it be more expensive to pay for additional pages in a well designed book? I do not view this as a negative. I agree. Kudos to publishers who mindfully use whitespace and other design elements to enhance the utility and presentation of the end product, even if it increases the page count a little! The "problem" products (perhaps that's too strong a sentiment), are not caused by mindful design. If you are using the products of a small hobby publisher in a niche market that had a limited budget to produce their products using the printing processes the late 1970s as your guide for good page and book design . . . you are doing it wrong. A lot has changed in book and page design since 1979. There is a huge difference between designing for the page and designing for the screen, too. 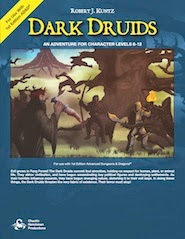 To compare the DMG to a Dragonsfoot PDF is comparing chimpanzees to chihuahuas. Perhaps it would behoove DIY book publishers to take some classes on graphic design and how it relates to book publishing at their local community college. Or, if you are in large city, at a university or arts organization. Columbia College in Chicago has a good program, as does the Center for Book Arts in New York. Or hire a designer who knows book design. Or just get a copy of the Non-designers Design & Type Book by Robin Williams (the designer, not the actor). Agreed. 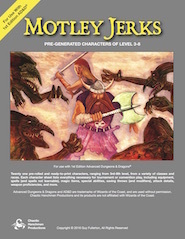 All of your observations are 100% spot-on for tabletop RPG product. The rebuttals so far seem more applicable to books of other kinds. 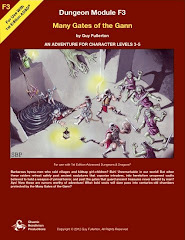 Chaotic Henchmen Productions aims to provide high-quality, well-written, great-looking products that support our favorite roleplaying games from an older era. Our products include a healthy amount of old-school design sensibility (both mechanically and visually), but we use a slightly more modern layout, which makes our products easier to use than their vintage counterparts. Chaotic Henchmen Productions is excited to be a small part of the growing retro/old-school roleplaying game community.